Erin Blegen: My Scrap Cabin: Prima: Featuring NEW Wood Icons! NEW Ingvild Bolme Shabby Chic Metals from Prima! Prima: Featuring NEW Wood Icons! Today's post is all about the new release wood icons from Prima! I must say I am absolutely in love with the fact that some of these come printed. If you're short on time (as I am MOST of the time), this is an absoulte time saver when it comes to wanting to dress up your wood icons. It's already done for you! Follow along on the Prima blog all week for these fabulous embellishments and more! 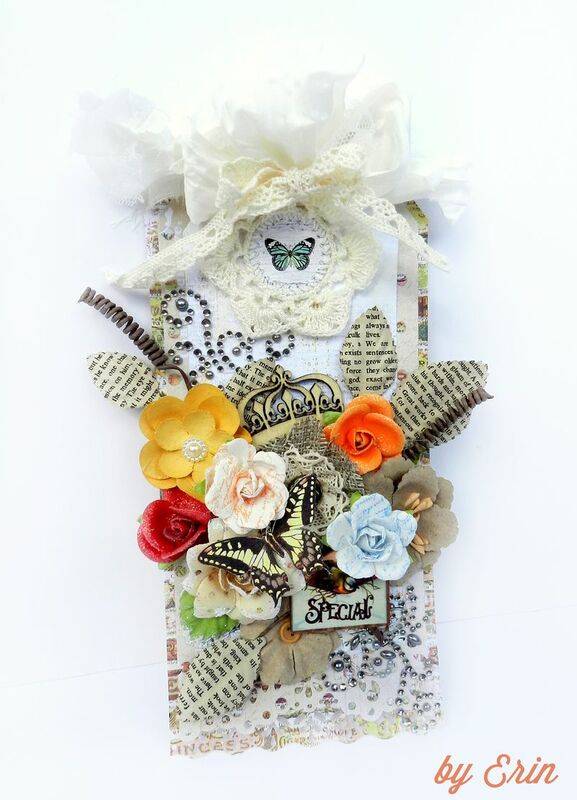 Absolutely gorgeous tag.. love all the layers and flowers.. and the book paper leaves look wonderful.. I love everything about this tag, Erin! Love that the wooden icons have printed images. The way you tie bows on your tags always looks so pretty. Maybe you can do a tutorial or video on how you make them.